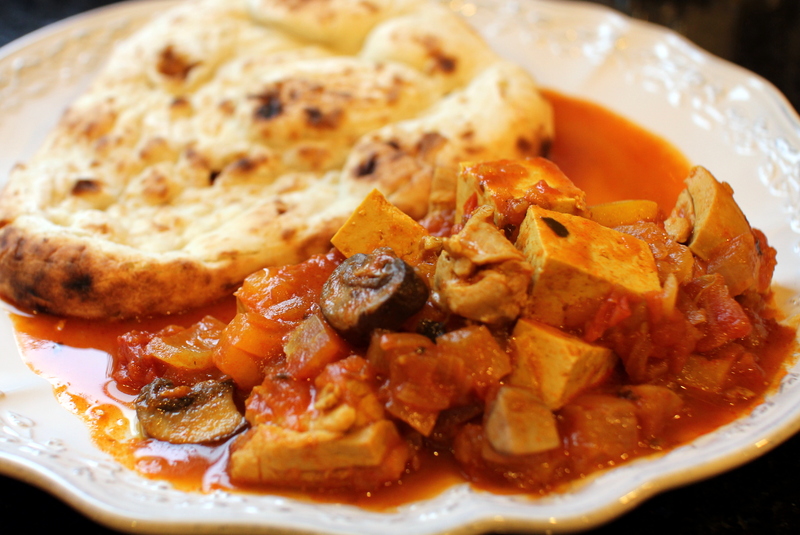 Chicken Masala [recipe] – Cin Cin, Let's Eat! I LOVE to eat Indian food, but when it comes to cooking it, I never have all the spice needed, and I don’t know enough about the cuisine to come up with my own dish using the ingredients on hand. But one great thing about grocery stores nowadays, almost all the major stores have an ethnic cuisine aisle, in which I can find pre-measured spice packets and jarred sauces. Of course some may argue that these products don’t result to authentic tasting dishes, but hey, I think they’re a great gateway for everyday cooks to try something new. 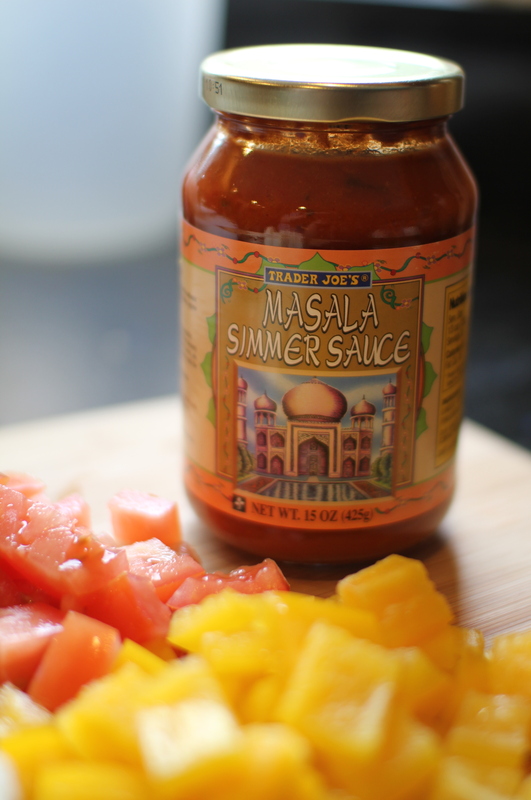 While shopping at Trader Joe’s, I spotted jars of the Masala Simmer Sauce (see picture below). 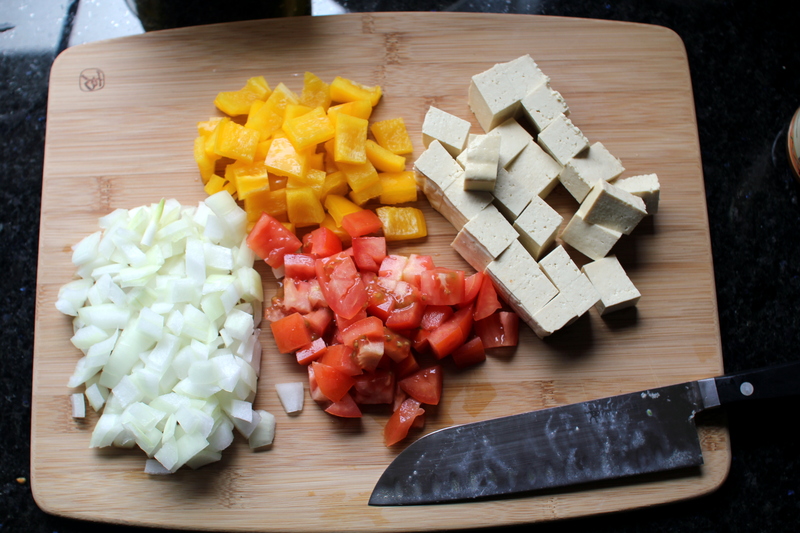 The direction sounded very simple, simply place cubes of chicken, add sauce and water and let simmer for 10-15 minutes. Those of you who know me, know that I like to jazz things up just another notch. Besides the chicken pieces, I added an assortment of veggies and tofu, and served the final product with some hot toasted Naan bread. This is, of course, not an authentic recipe for chicken tikka masala, but it was simple and flavorful, an easy and quick dish to make when you’re craving something different. Love this sauce–a trick I’ve learned from multiple people is to add a scoop of sour cream (or I assume you could use anything similar) to the TJ’s simmer sauce to give it that creaminess and thickness that you often find at Indian restaurants here.